Easter is a defining holiday of springtime that ushers in thoughts of blossoming flowers and children running through the yard hunting for Easter eggs. However, celebrations aren’t just for kids. 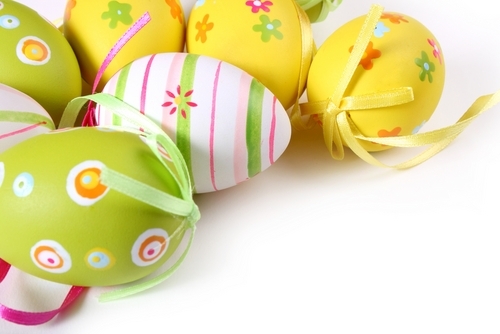 The Easter season is a great time to remind employees how valuable they are with a themed party and personalized business gifts. A common decorative theme for springtime events, especially Easter, is a pastel color palette. Start by dressing up the party space with balloons, streamers and color coordinated paper goods. Shades of pink and purple are often associated with Easter, and plates and napkins with bunnies or eggs on them could take the holiday vibe to another level. Centerpieces can be simple like bright flower arrangements or Easter baskets full of candy on each table. For a craftier look, use several colors of dye to decorate a dozen eggs and arrange them on a cupcake tower with live greens or Easter basket grass. Marshmallow peep variety kabobs can double as decorations in vases and themed treats for the party guests. An excellent staple for an Easter menu is eggs, for obvious reasons. Deviled eggs are a good appetizer and finger food to serve at the party. With a brunch-type menu, eggs can be a more central part of the meal whether the entree is eggs benedict, egg sandwiches or quiche. Meats such as lamb or ham are some traditional entrees that can be incorporated, depending on how sophisticated the party will be. A carrot cake or cupcakes are great for dessert at Easter themed events. In case of a nut allergy or aversion to the spiced flavor, it’s preferable to offer a second dessert option. For an added touch, arrange napkins and utensils in Easter baskets for guests to take with food. Spoil employees with a small gift of appreciation. It would be fun to adopt the Easter Bunny persona by providing personalized chocolates and edibles to the staff. A thoughtful addition would be promotional thank you card with the sweets to fully express gratitude for employee’s hard work. To organize an extra giveaway, fill plastic eggs with a candy-of-choice. Fill one to three of the plastic eggs with a different treat, one similar in size and weight to the first. Have each employee choose an egg, and whomever selects the special egg or eggs can pick from a selection of personalized tote bags.